My "Know it All Friend"
It’s time to Ignore your friend “Google”. It’s our first blog of 2015…and we just had to make it something enjoyable…we are sure you will get a good laugh…careful though, you might just learn something! In our circle of influence, we’ve all got that one person who is an expert on every subject. You are probably picturing them right now. You know who they are, they are the people who either know a lot about a few things, or a little about a lot of things. You may in fact be this person! YIKES!! We all know someone just like this. 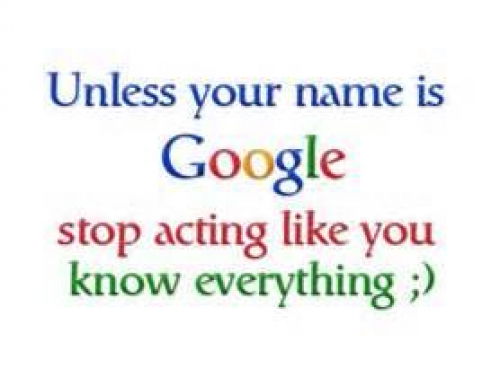 I know someone like this…I refer to him as “Google”. Your "Google" may go by a different nom de plume, but it’s my blog and I can do whatever I want to…and so I am going to use “Google” as the name of our universal know it all friend. My friend Google, has an opinion on everything. It doesn’t matter if you are talking about something as tedious as Organic Spinach or something as complex as Quantum Mechanics…Google always has an answer…Google knows all! But it’s amazing, the number of people, who listen to him as if he was Jesus. It's a classic case of the Dumb leading the Dumber. Guys like Google don't like to be challenged…but once in a while I will challenge him to back up his answer with evidence…and believe it or not, he does…sort of. The problem is that most often his evidence is clouded with pseudo science, hearsay, and of course a dab or two of homegrown B.S. He says it with such conviction…it’s almost believable. It would be so refreshing if Google were one of a kind…but alas, he’s not. In fact, there are Google clones running amok – everywhere! People giving advice who really don’t know what the hell they are actually talking about! Be strong…it’s a new year, a time of new beginnings. We challenge you…IGNORE EVERYONE! Stop listening to people like Google. 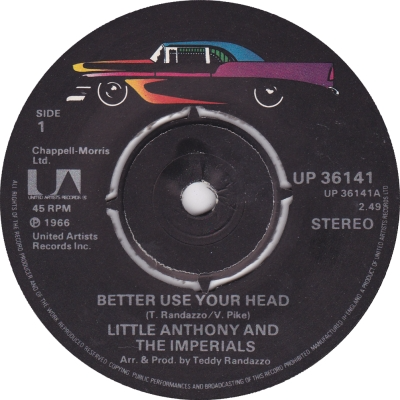 Instead, use your head....it's what Little Anthony and The Imperials would have you do. Do you really think your pal Google really has a better understanding than an educated professional on things like Compounded Interest and Long Term Financial Projections? Does Google really know if there is a Cure for Cancer in the heart of the Rain Forest of Brazil? And really…does Google know anything at all about Mortgages??? When it comes to Mortgages – the last person you should be talking to is Google. Google isn’t paying your Mortgage. Google isn’t a Mortgage Professional, and more importantly…Google doesn’t have access to enough information to form a proper opinion. In the same basic realization about seeing a Heart Surgeon when you need Heart Surgery…it makes equal sense to see a Mortgage Professional (not a BANK CLERK) when you need a Mortgage. Google is a great source of information…a lot of it though is misinformation and it gets tough to sift through all the nonsense out there. Rather, stop and think about it for a moment...use your head. You'll be better for it!